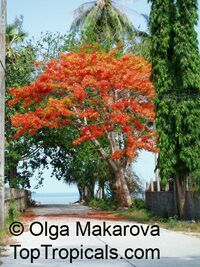 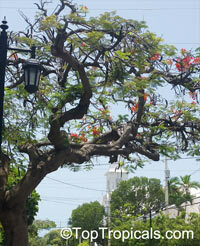 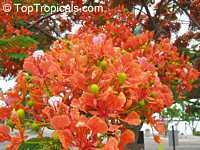 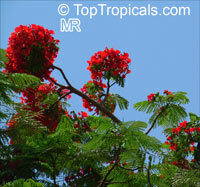 One of the most conspicuous flowering trees seen in the tropics. 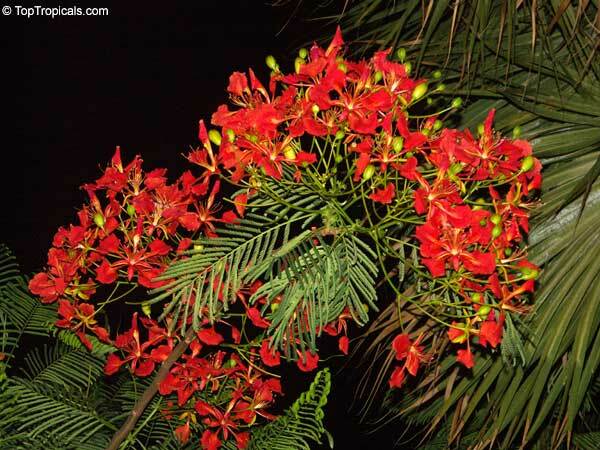 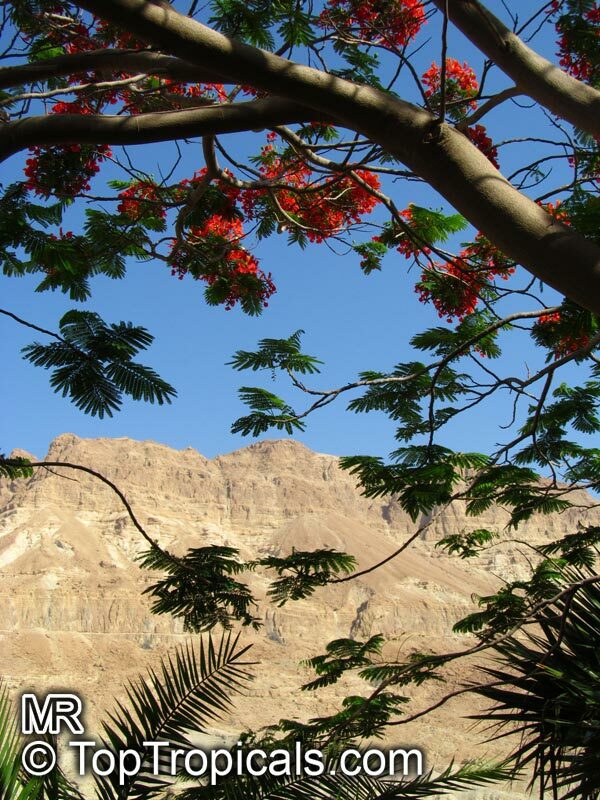 Bright fiery red/orange blossoms cover its mimosa type leaves which close up and go to sleep for the night. 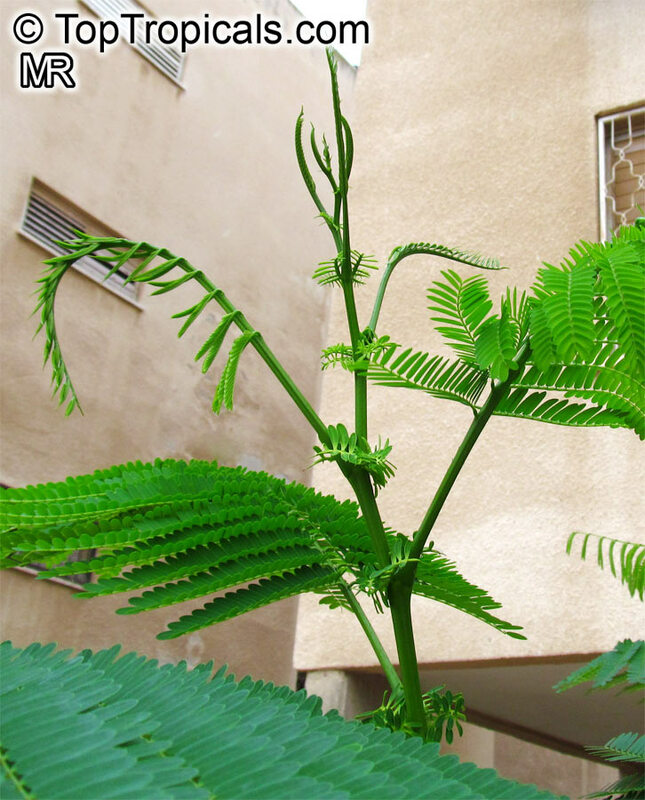 Can be grown as a potted tree. 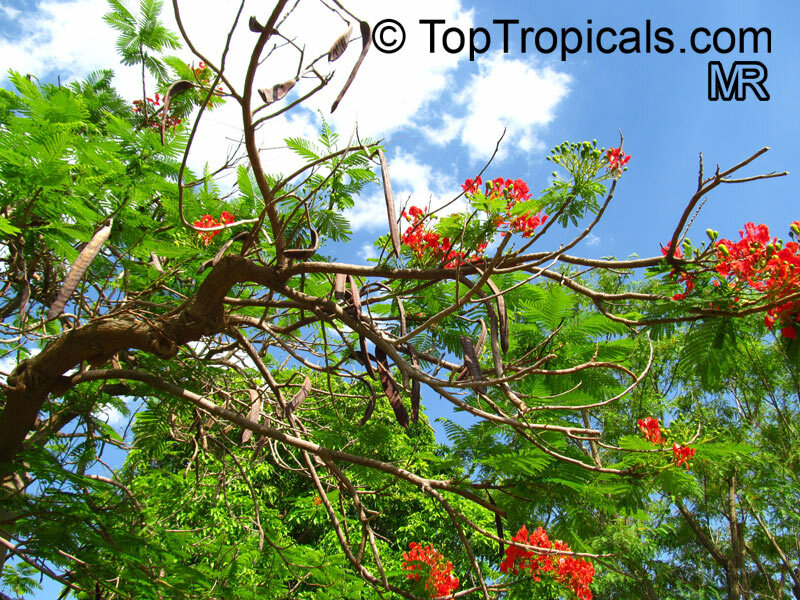 Very tropical! 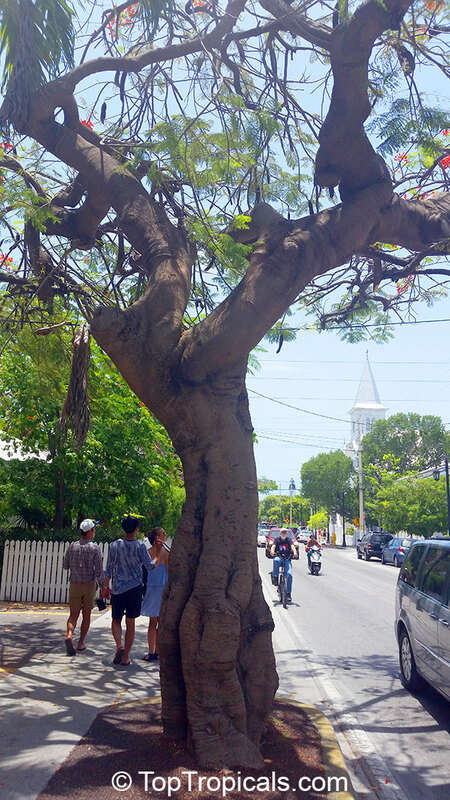 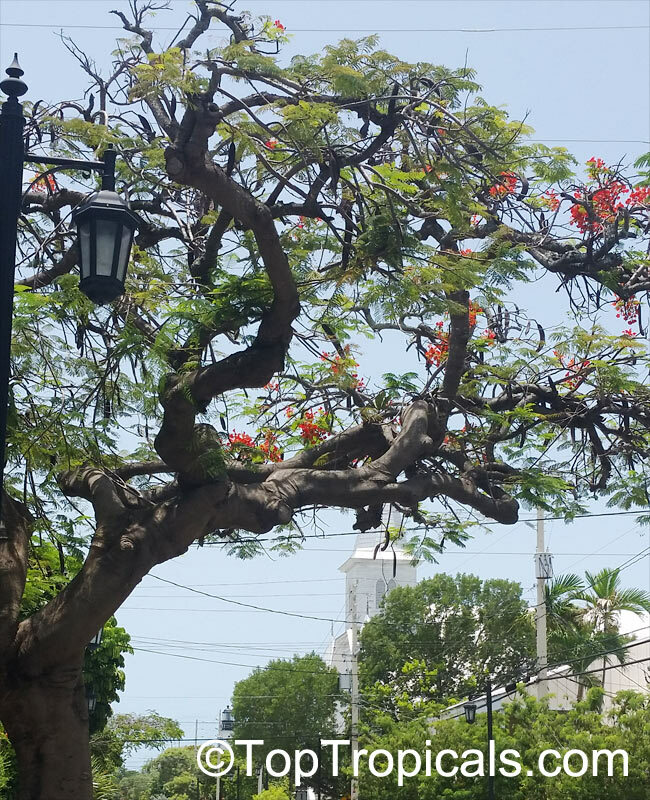 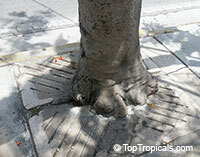 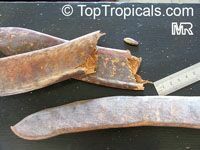 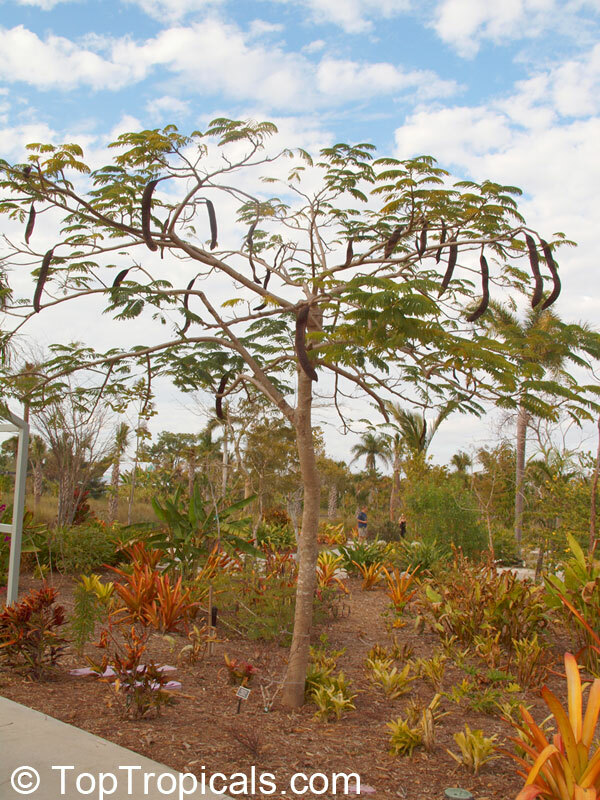 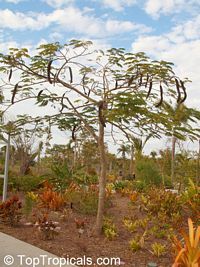 This large tree, which naturally assumes a spreading umbrella shape, is now found in gardens, parks, and planted along streets throughout the tropics. 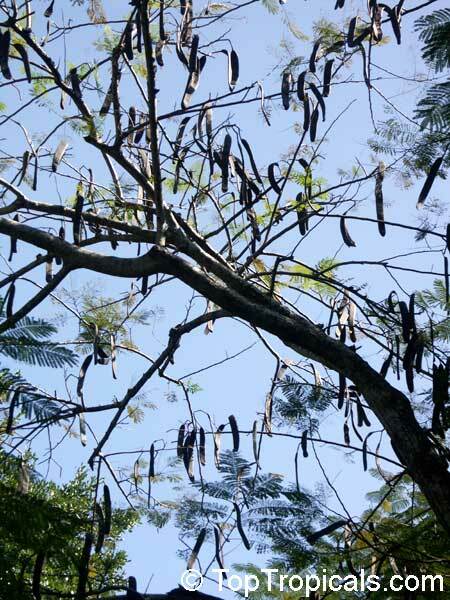 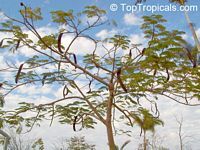 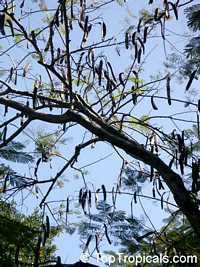 It can grow as tall as 59ft and has smooth greyish-colored bark and attractive feathery, fern-like leaves, which drop annually during the dry season. At the same time as the new leaves appear, the tree is covered with masses offive-petalled flowers that are usually bright red-orange but may also appear in pale apricot. 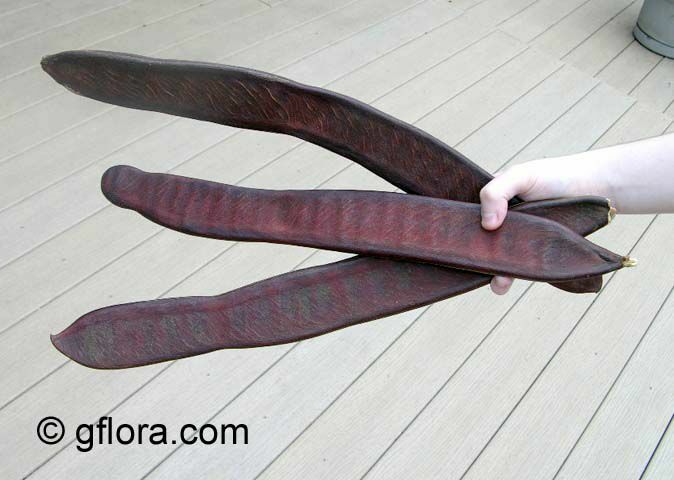 Blooming is followed by long, flattened, leathery dark brown or black seed pods. 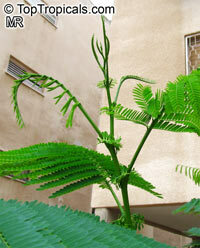 Delonix requires full sun and adequate space to take its characteristic form. It flowers best in areas that have two distinct seasons but can be impressive even in moister places. 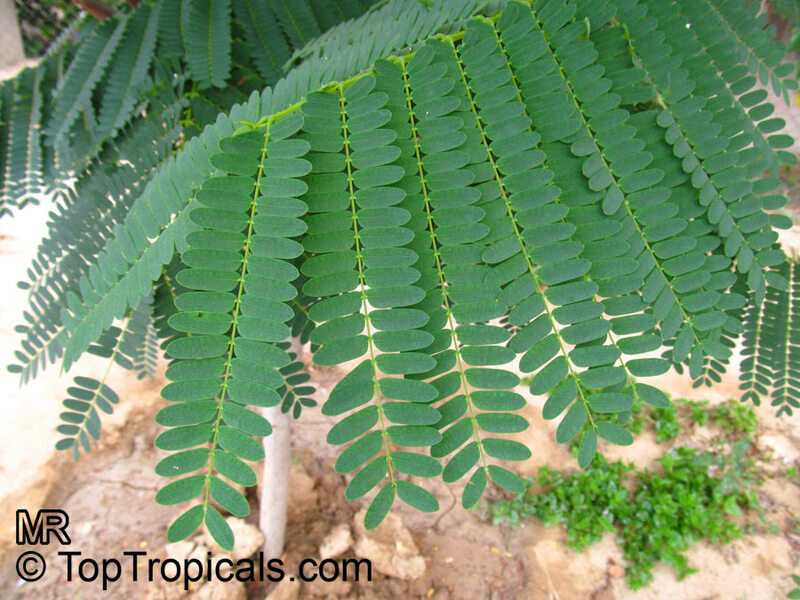 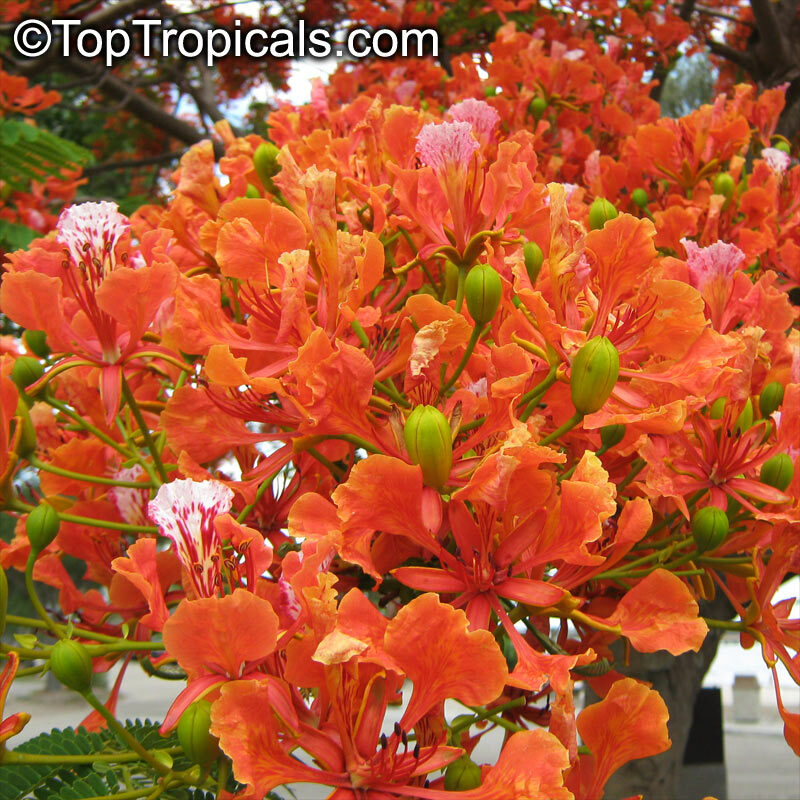 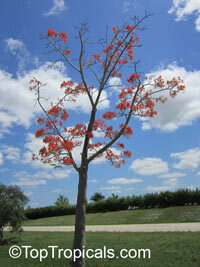 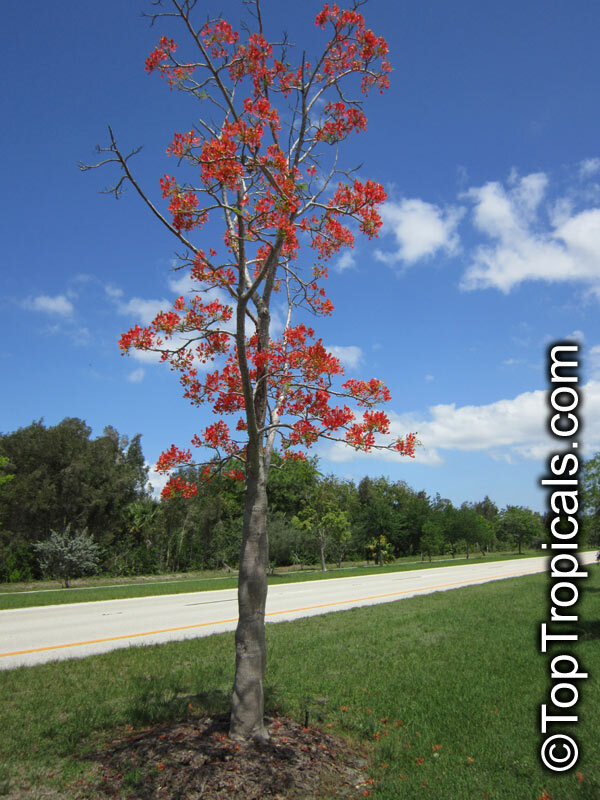 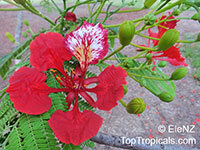 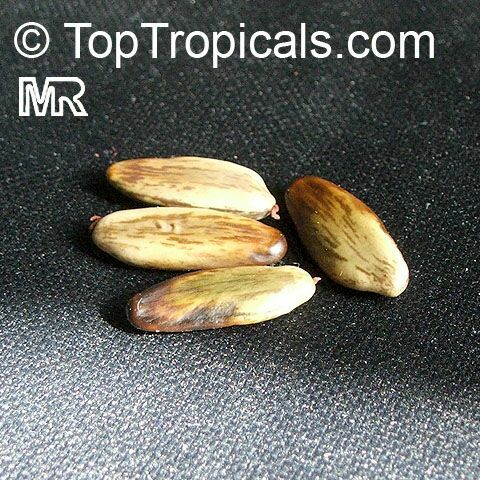 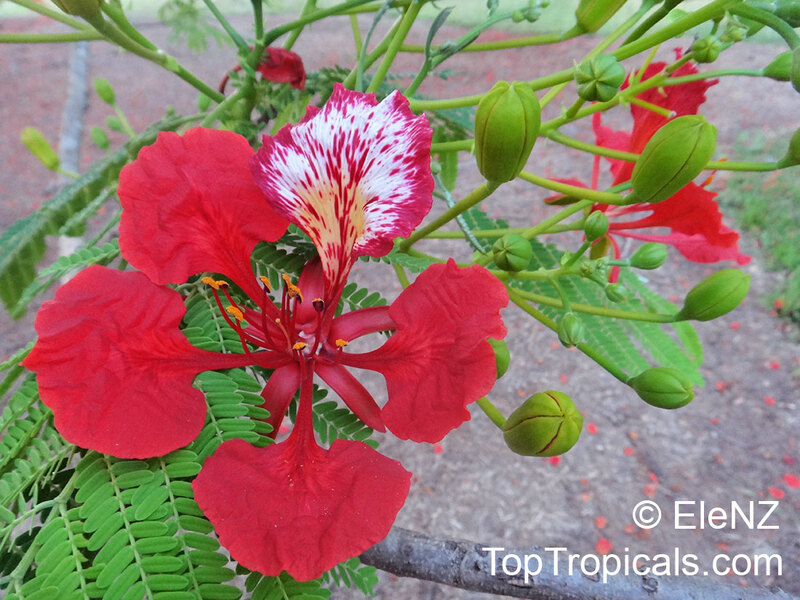 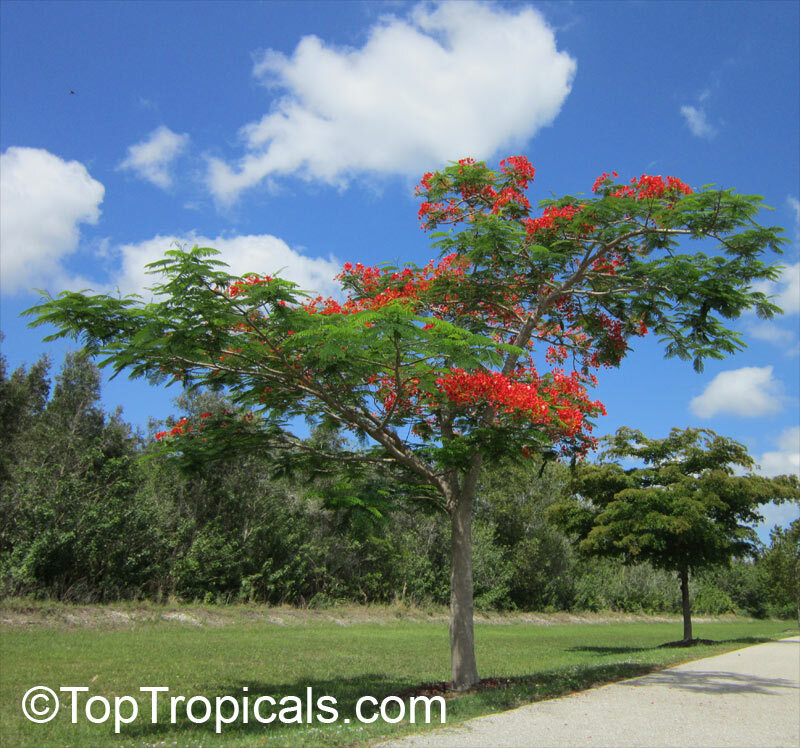 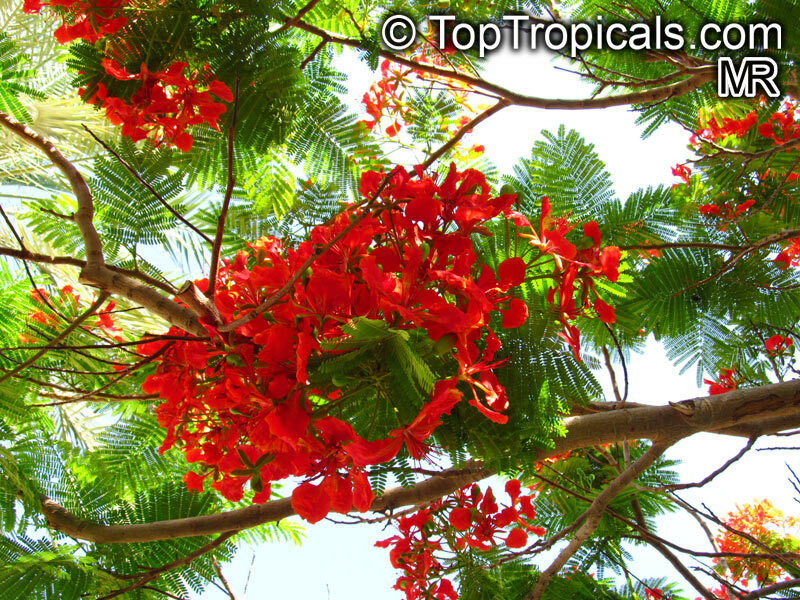 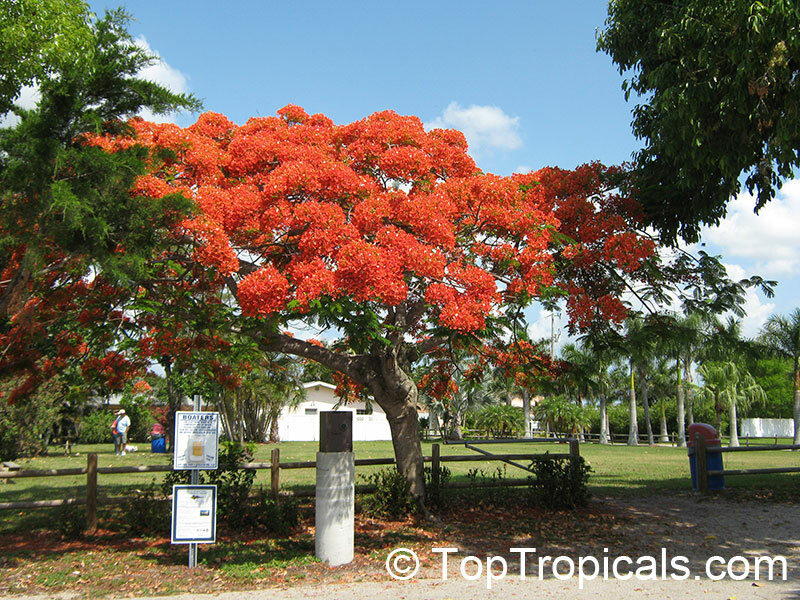 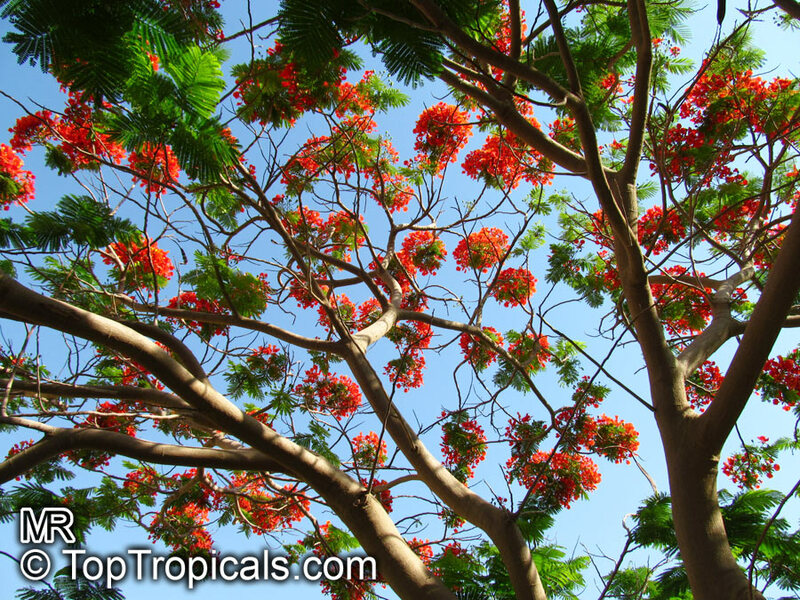 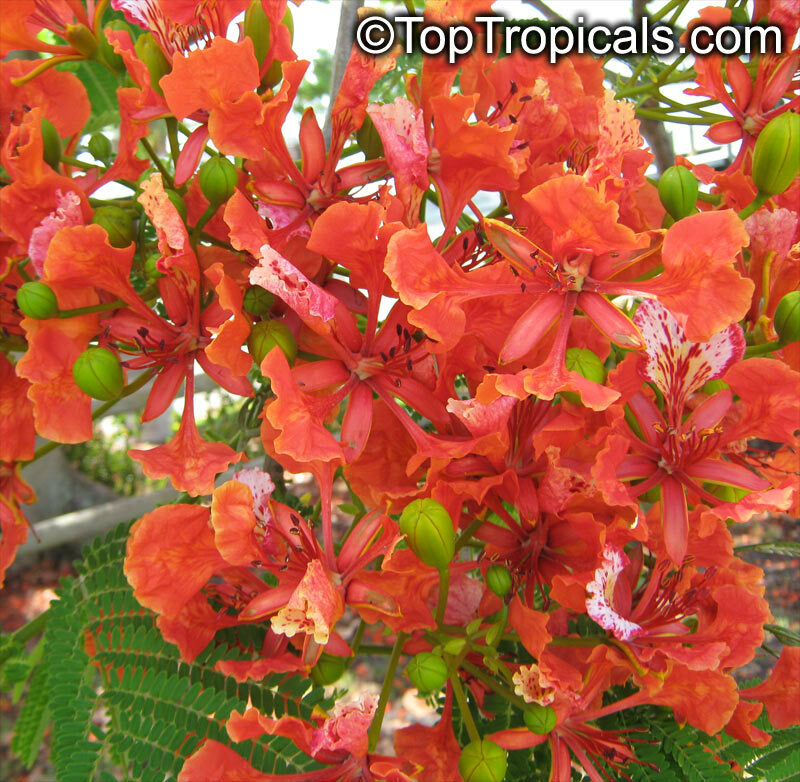 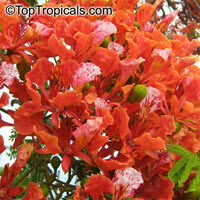 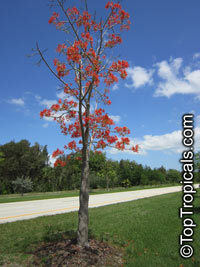 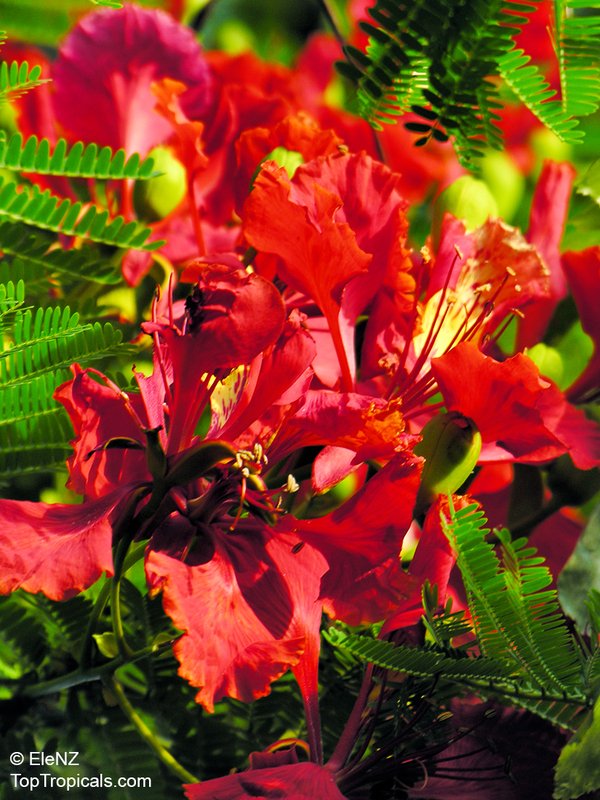 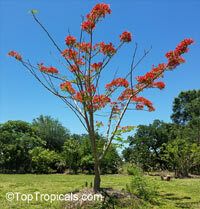 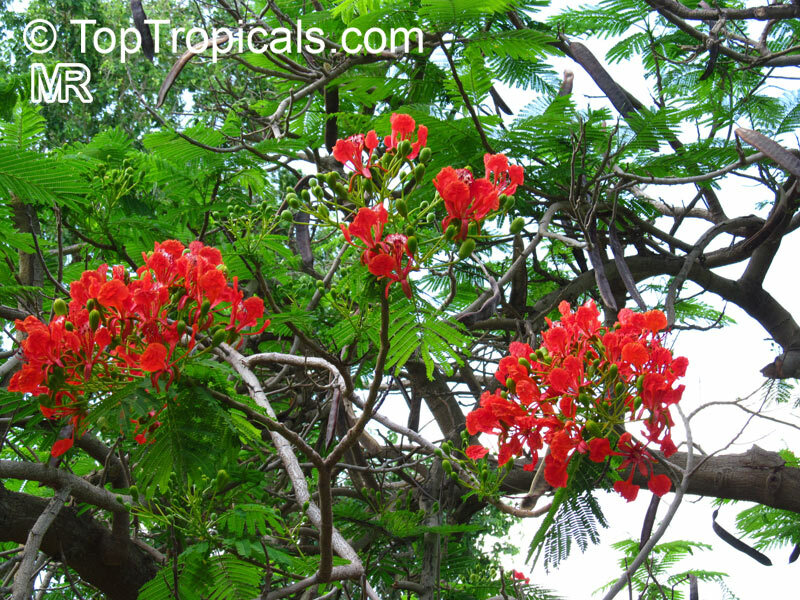 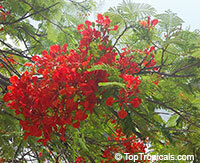 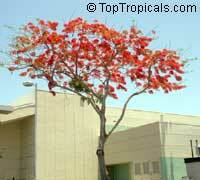 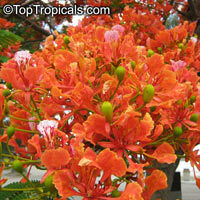 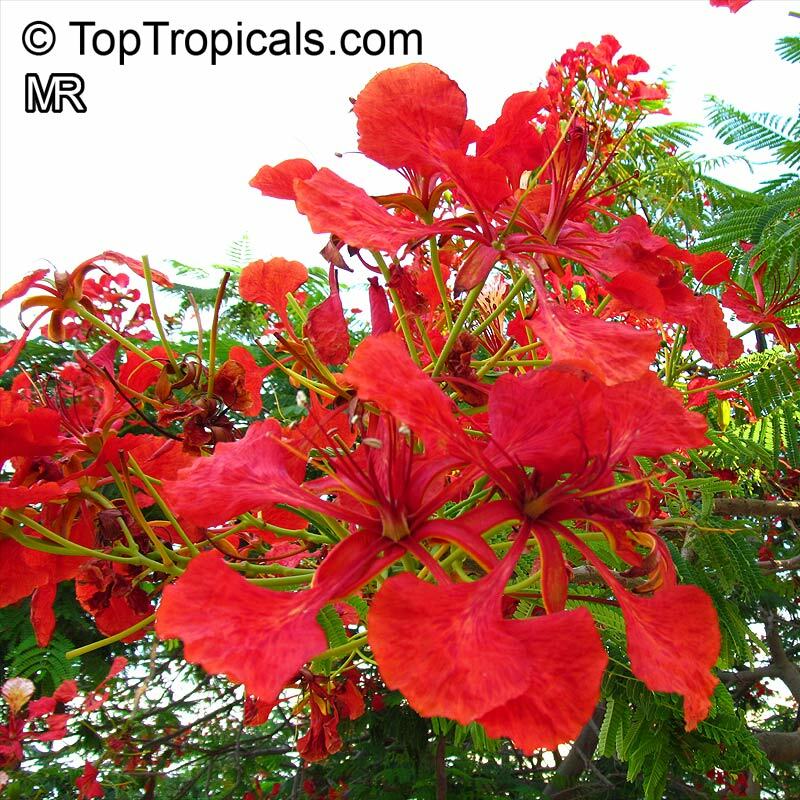 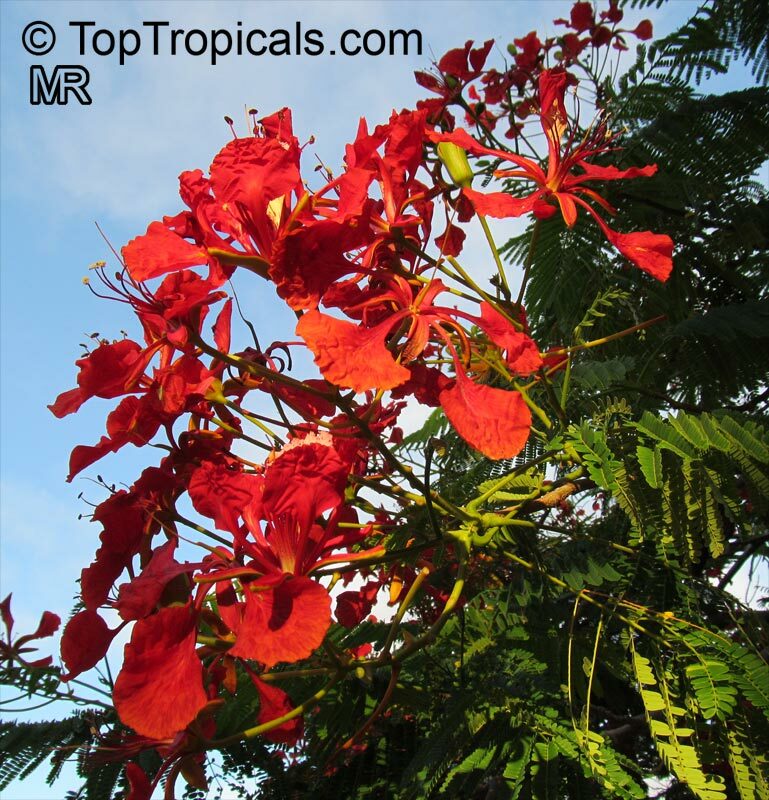 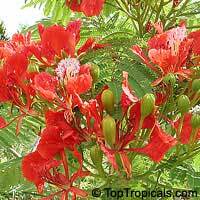 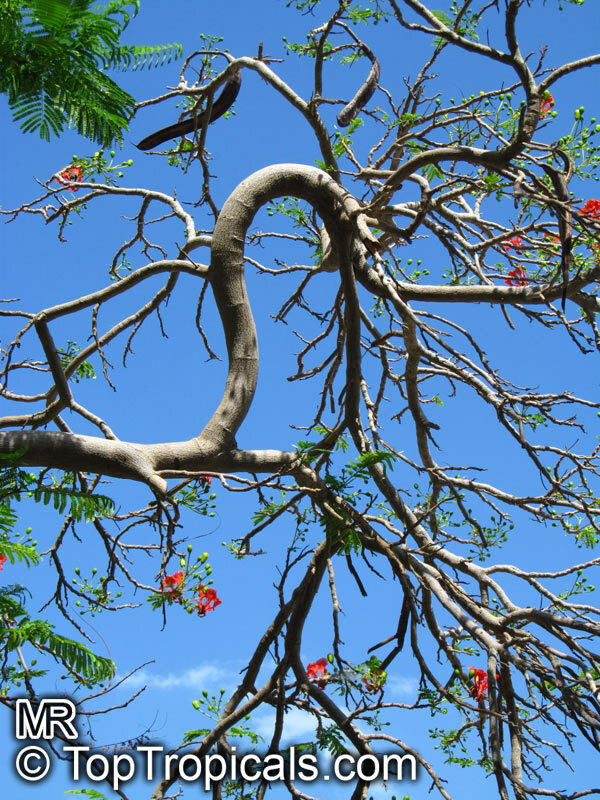 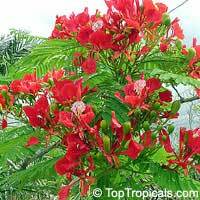 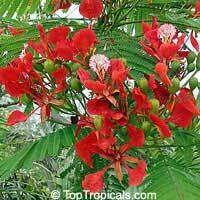 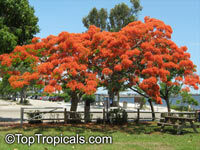 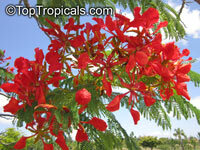 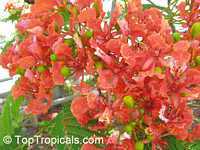 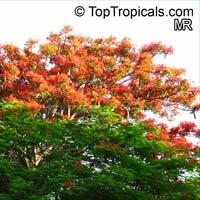 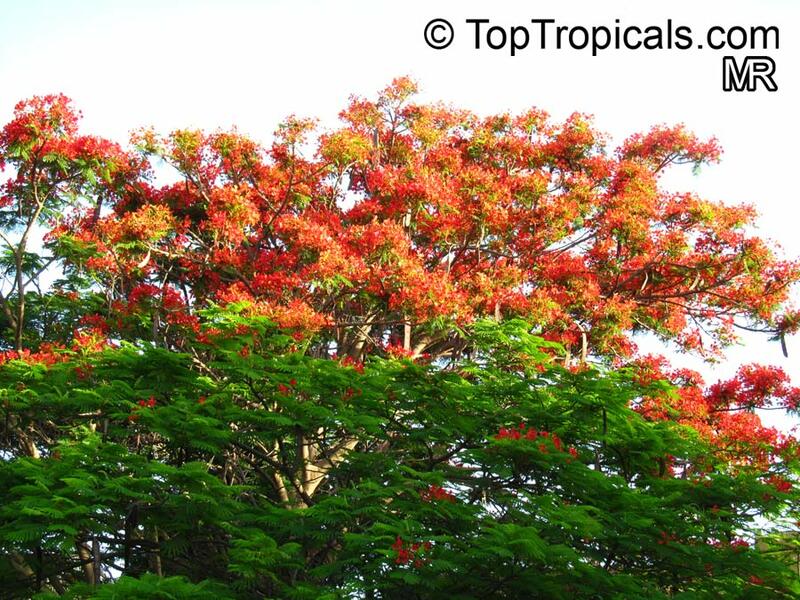 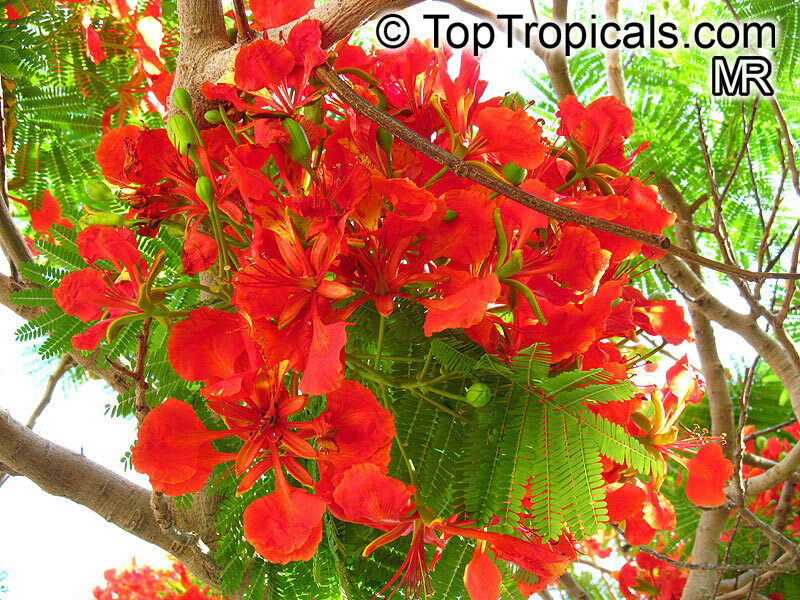 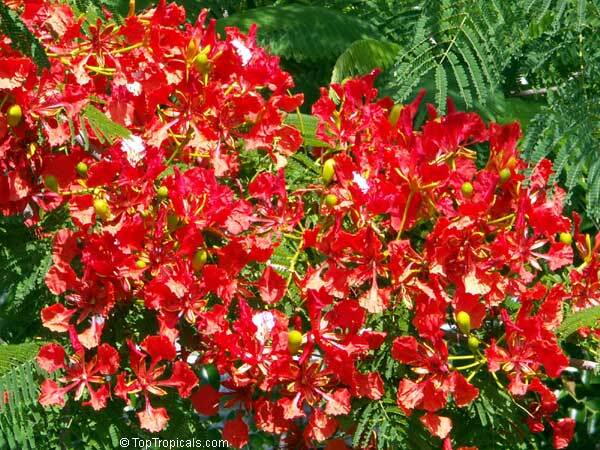 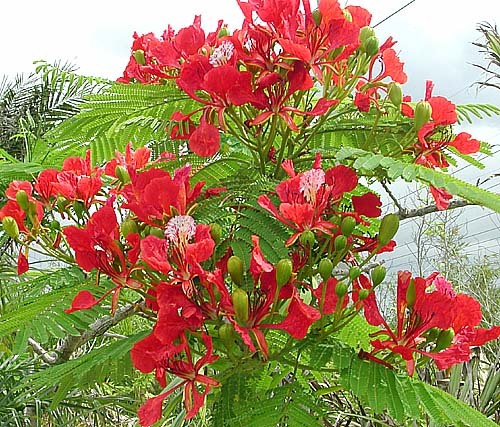 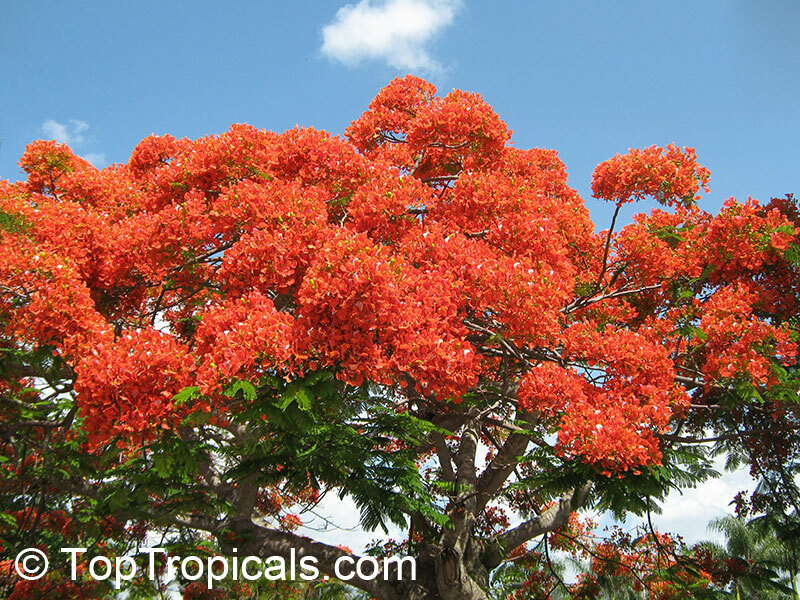 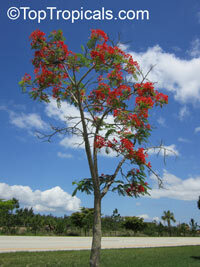 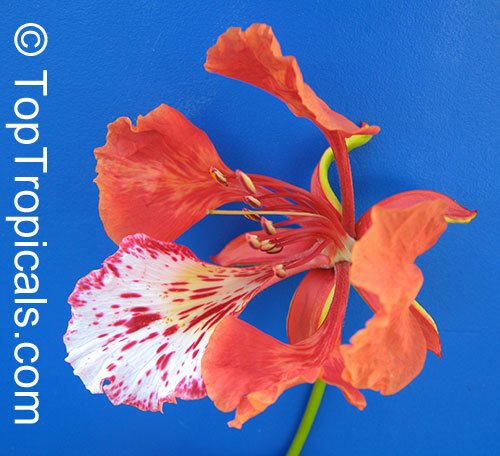 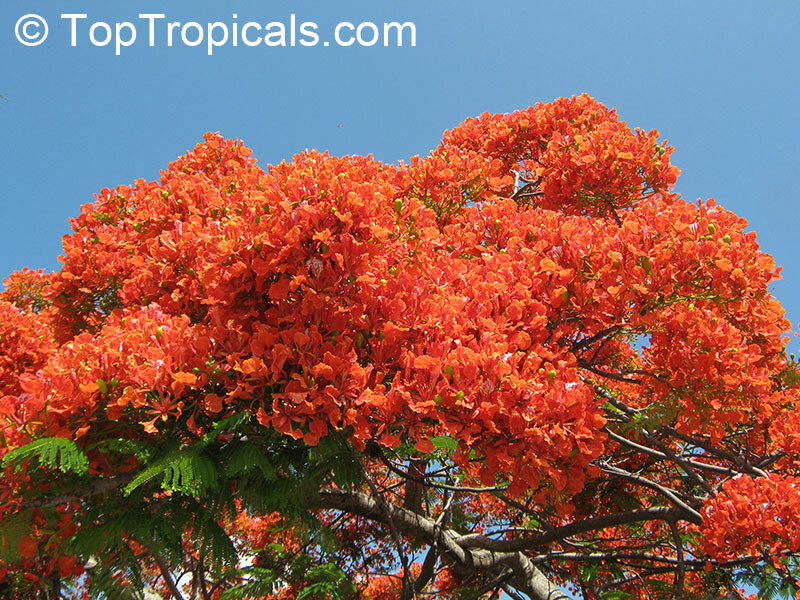 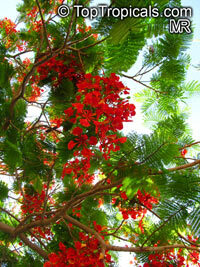 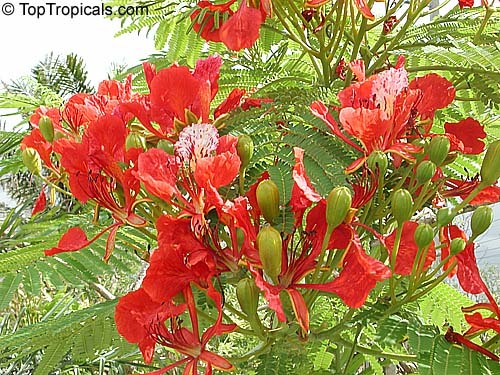 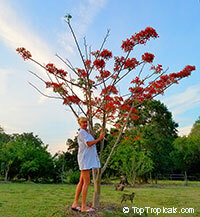 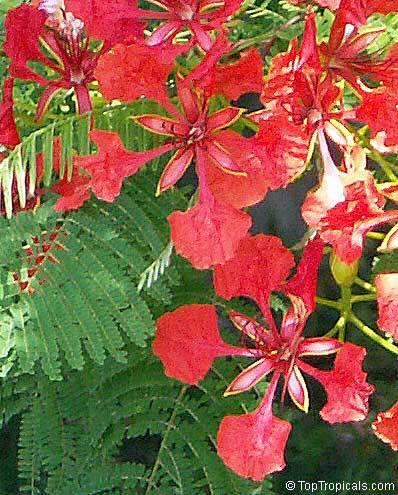 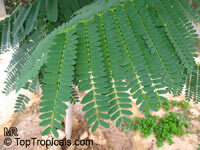 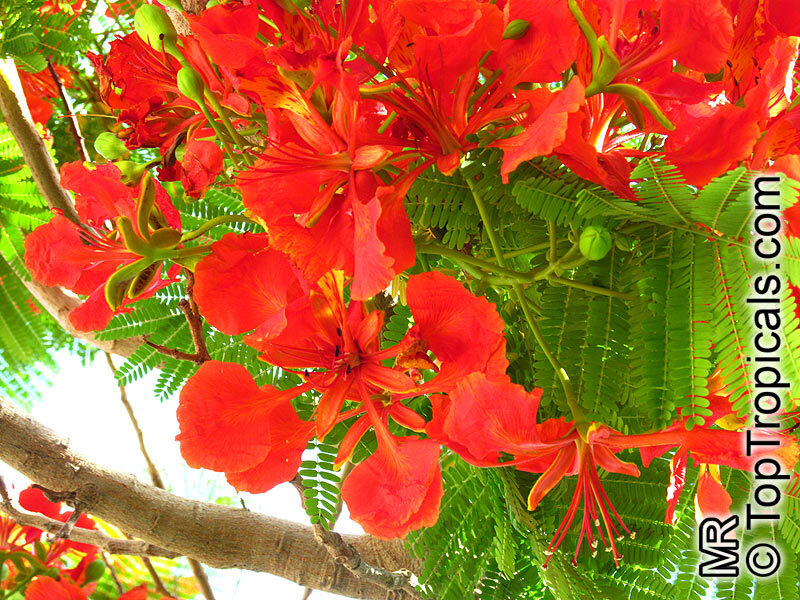 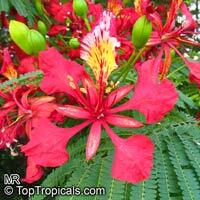 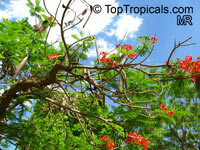 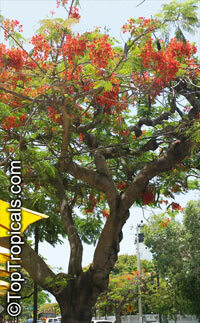 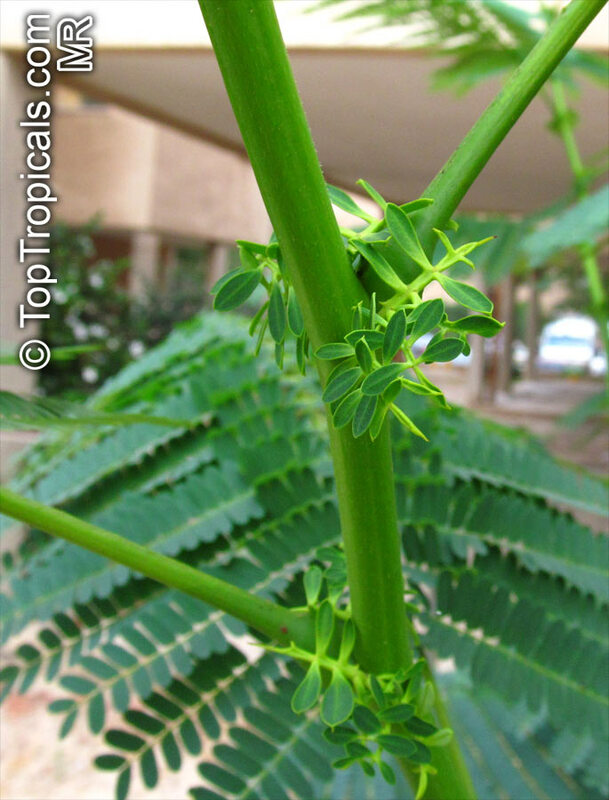 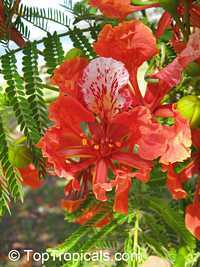 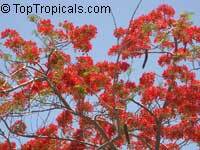 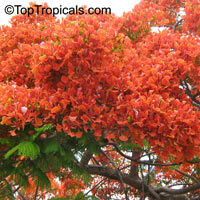 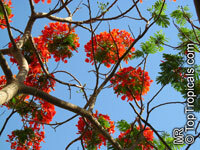 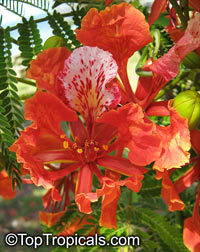 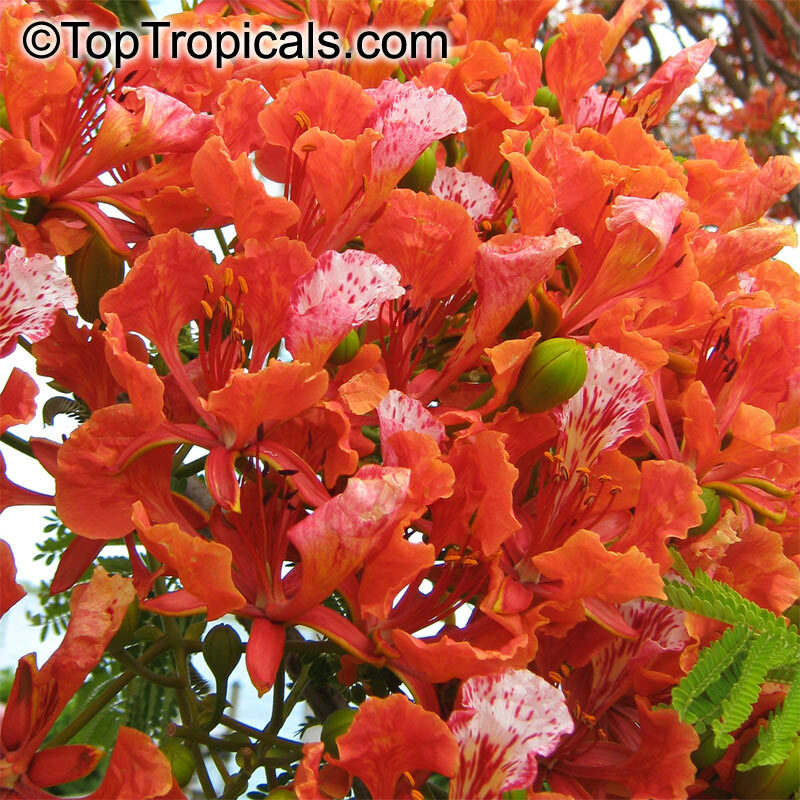 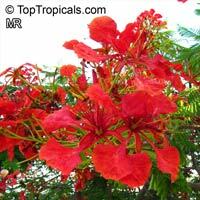 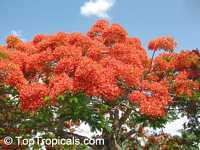 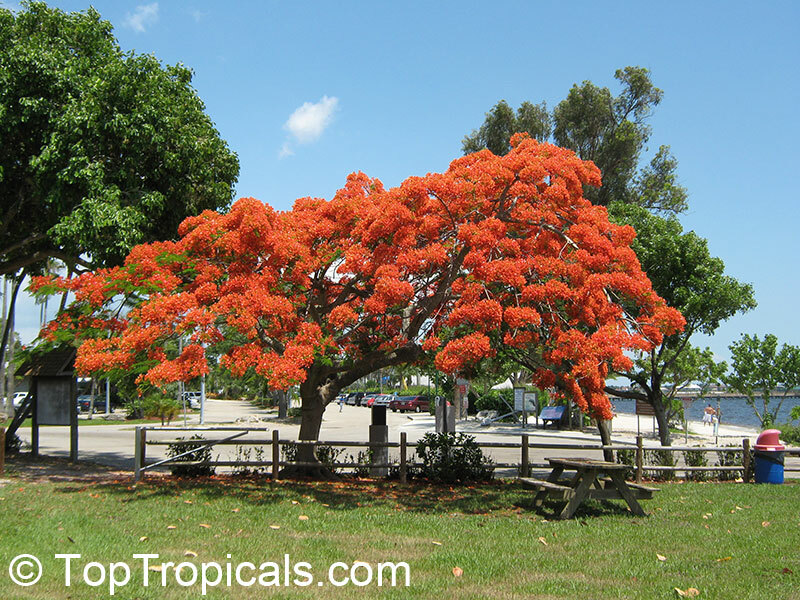 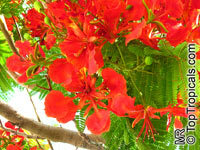 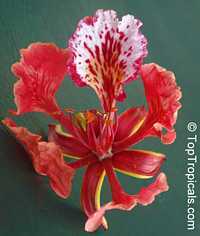 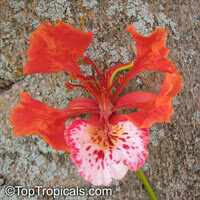 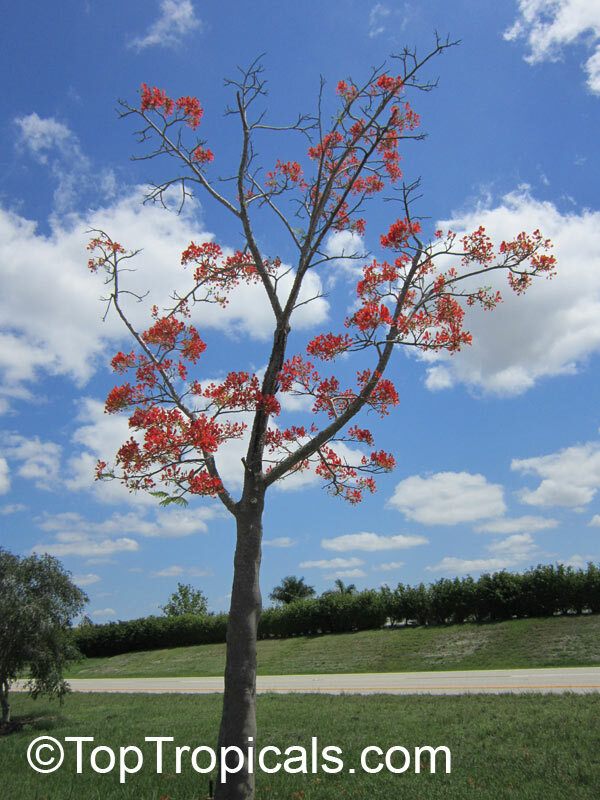 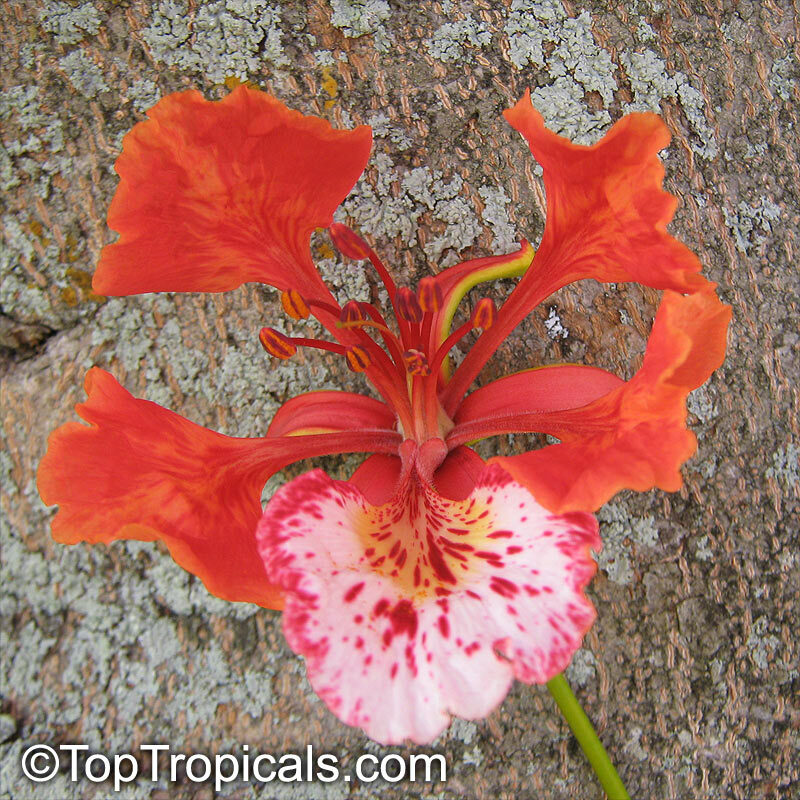 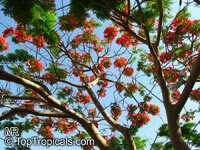 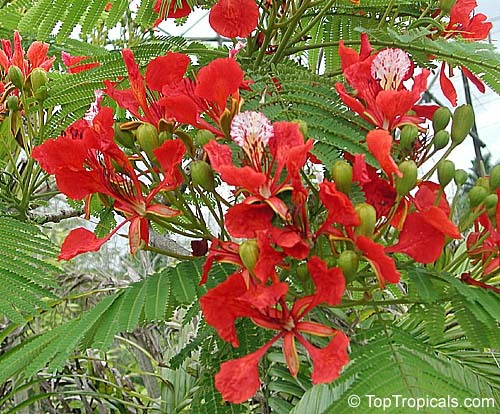 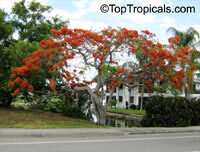 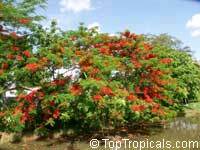 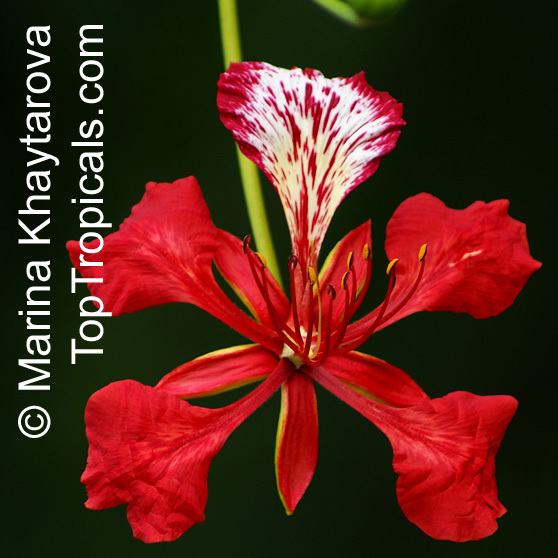 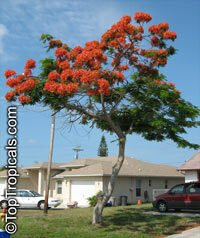 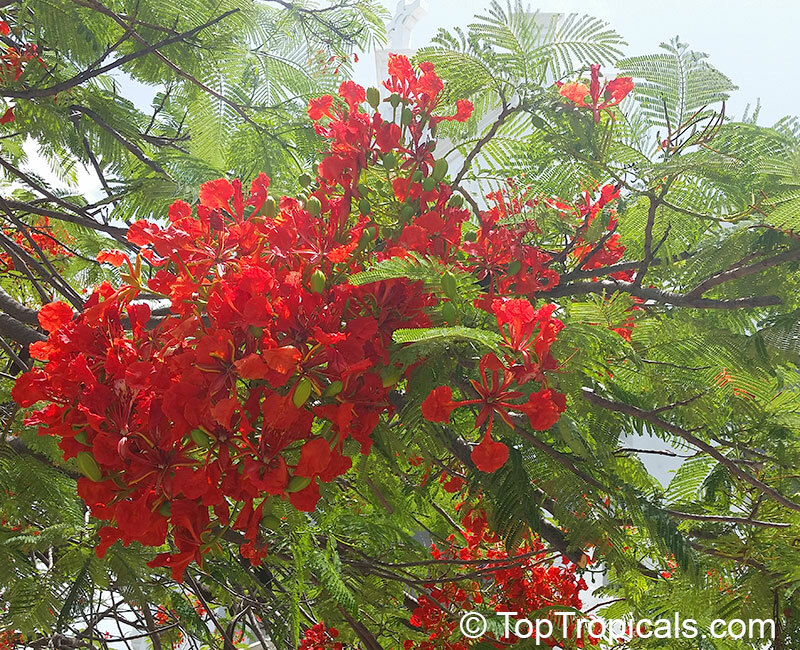 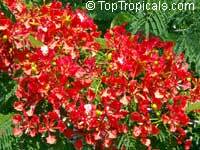 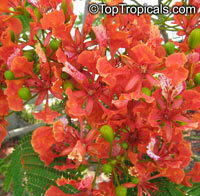 Royal poinciana - easy to germinate. Fast-growing tree. 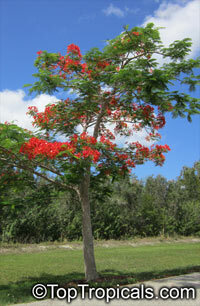 All our delonix trees are grown from seeds. 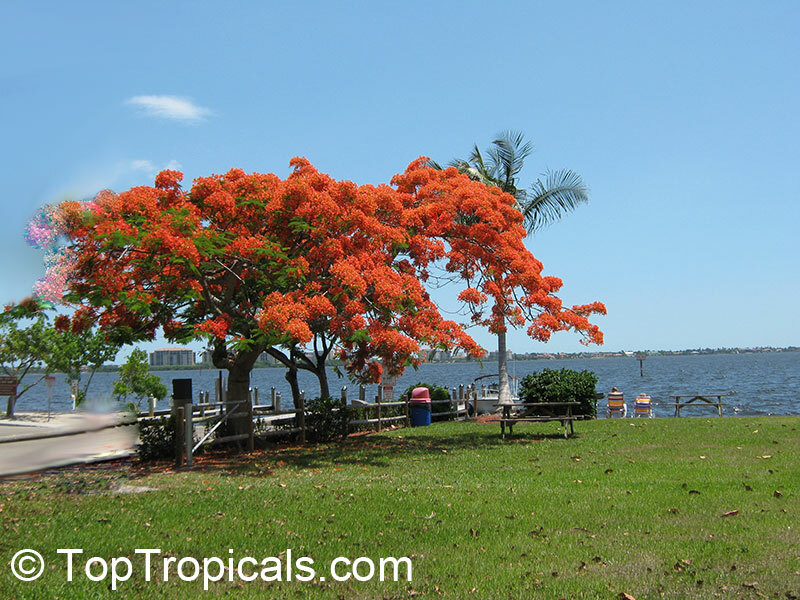 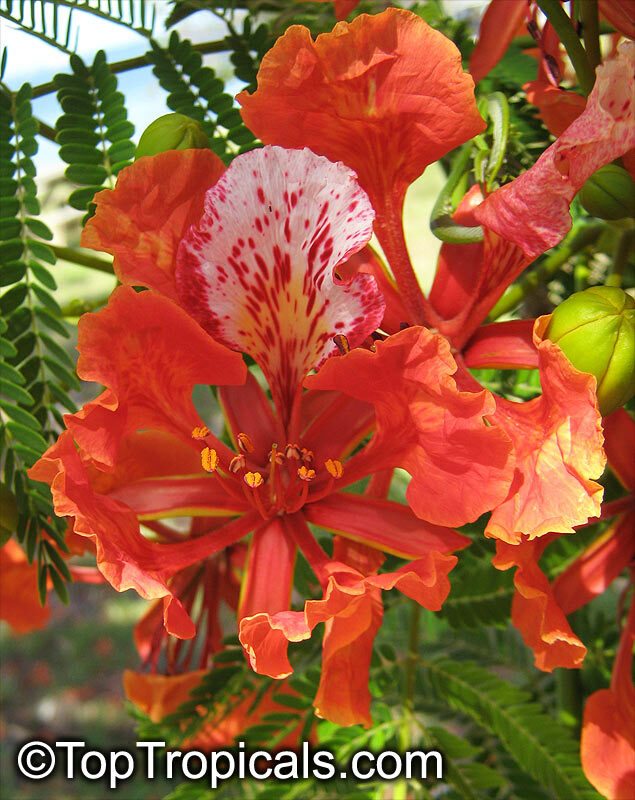 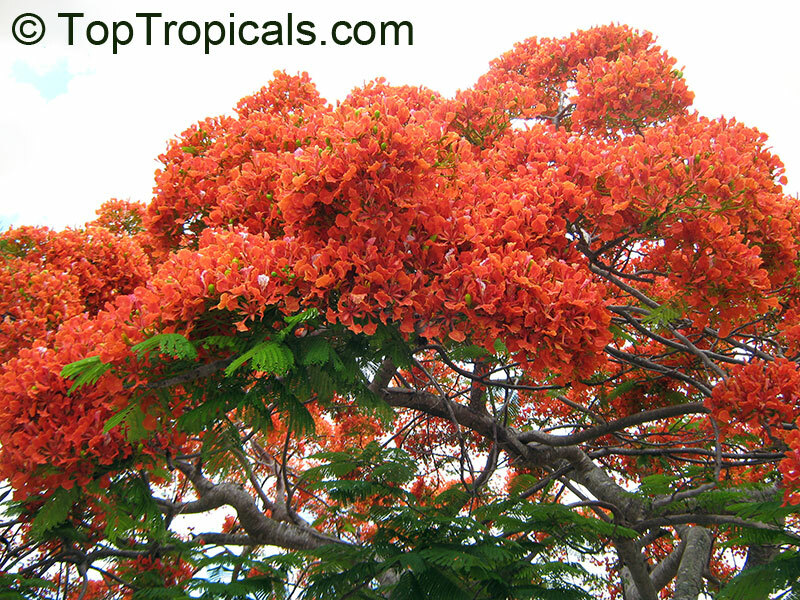 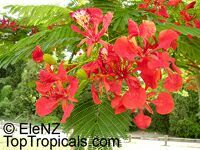 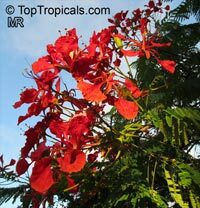 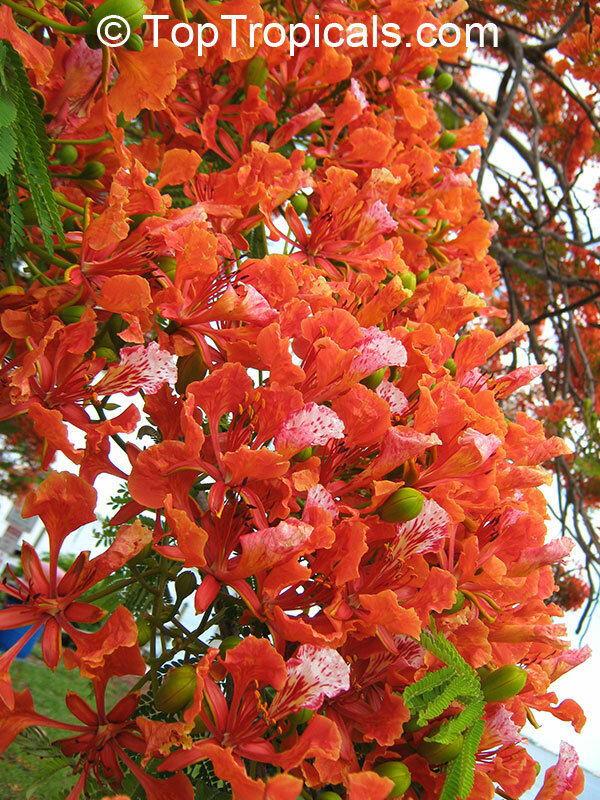 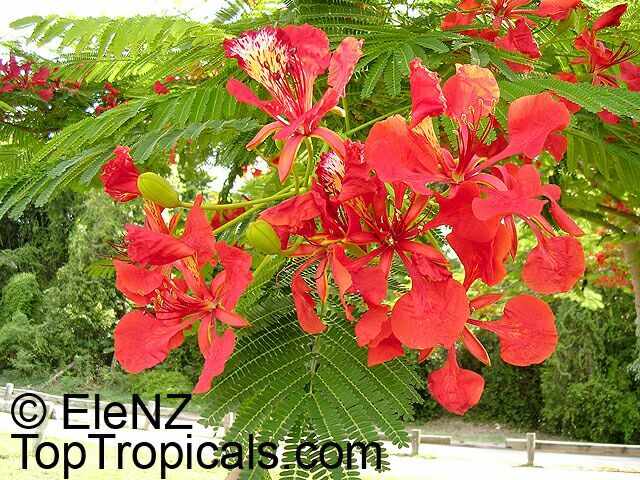 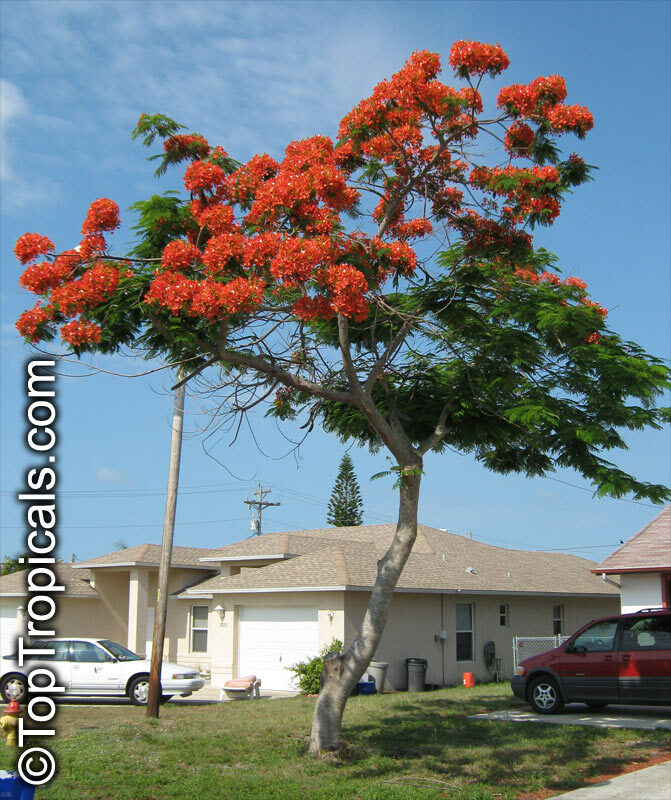 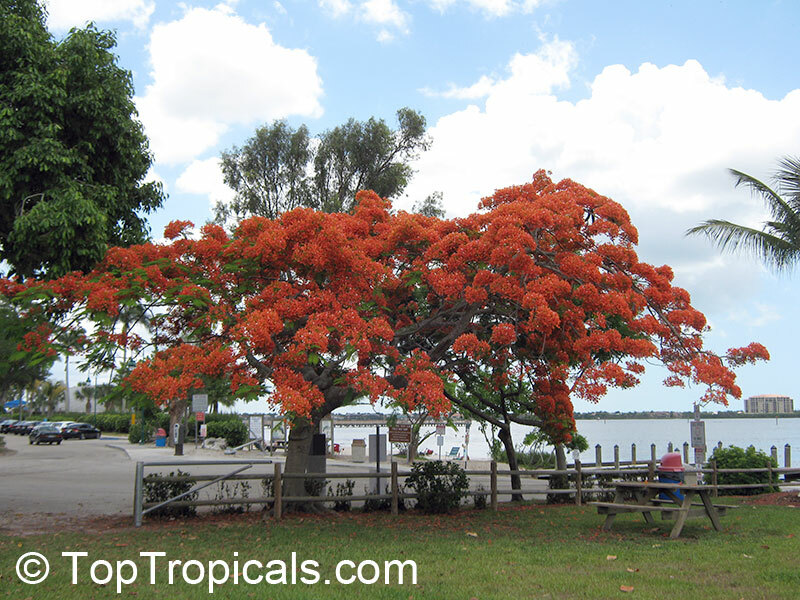 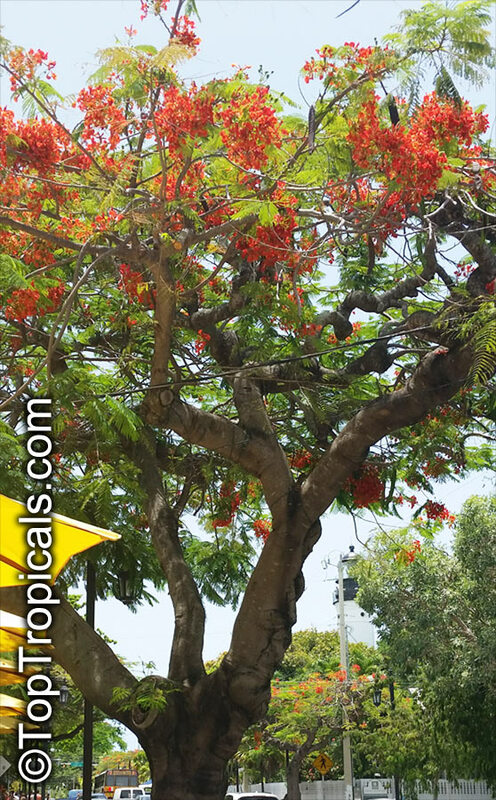 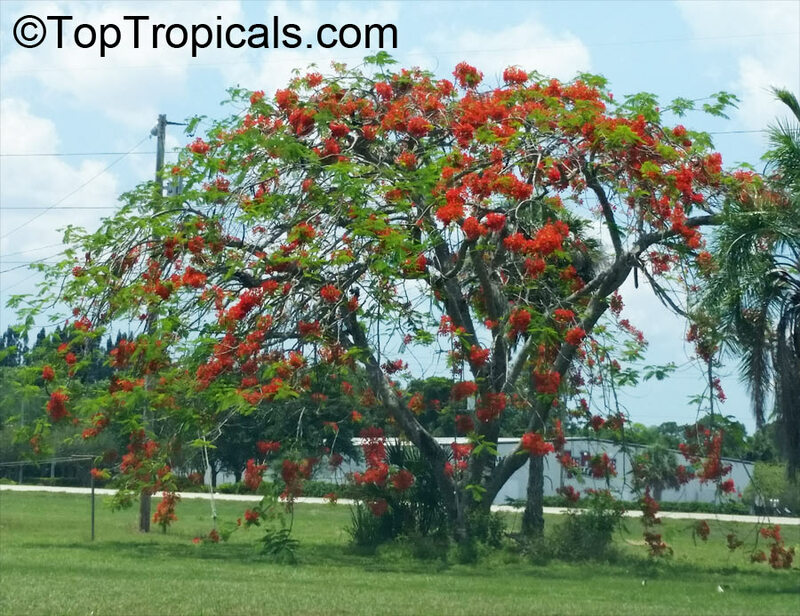 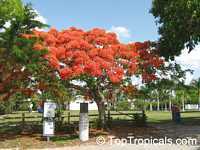 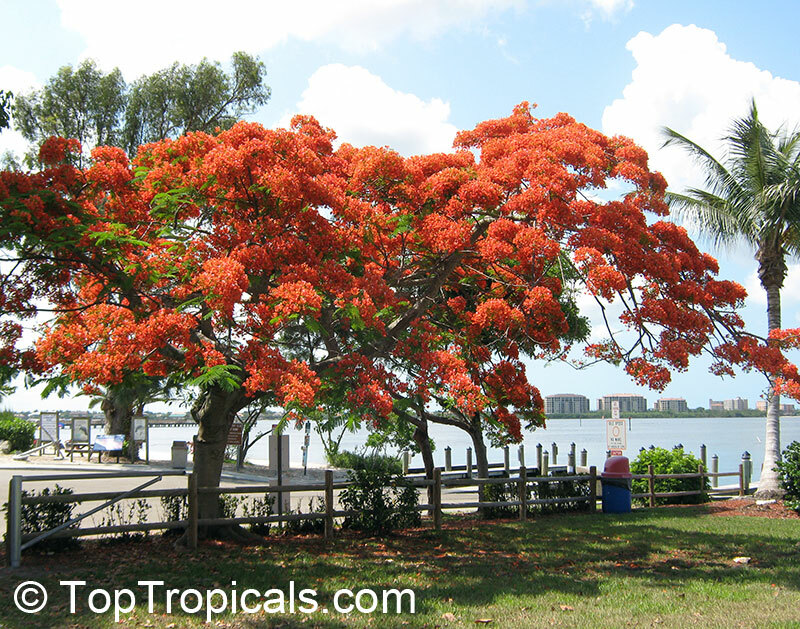 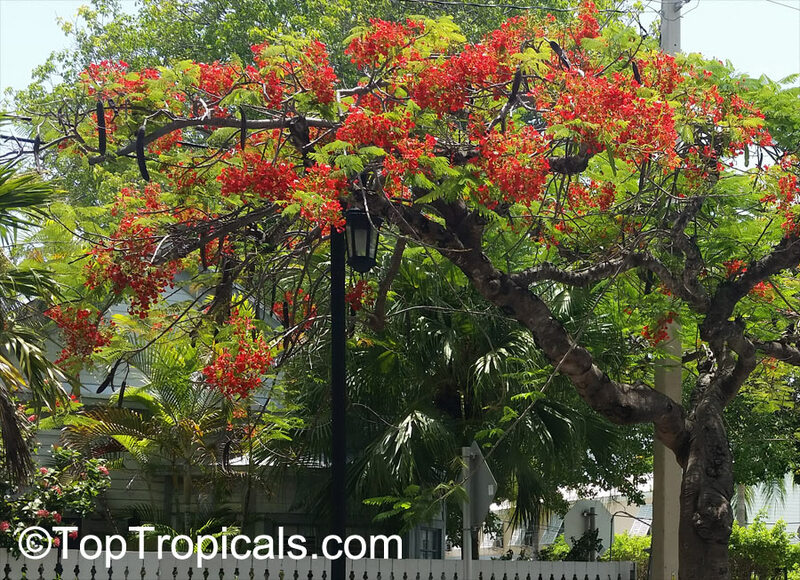 Royal poinciana - one of the most popular tropical trees covered with bright red orchid-like flowers from late winter through early summer. 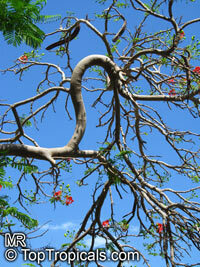 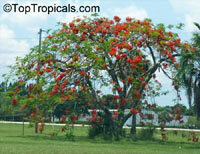 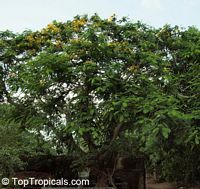 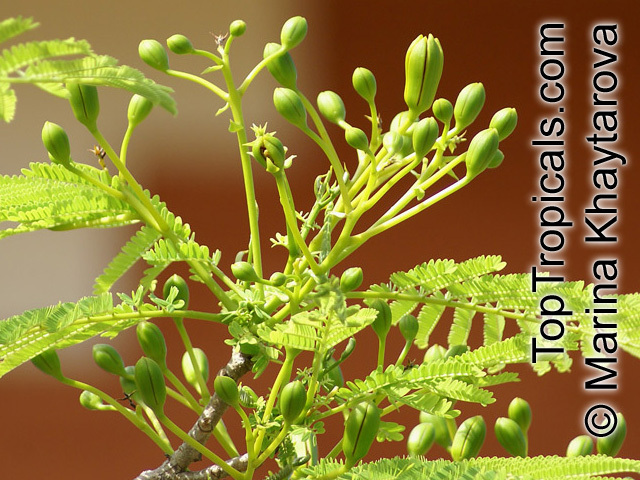 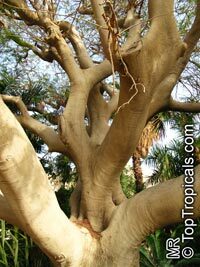 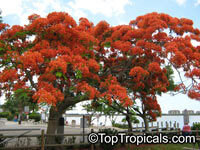 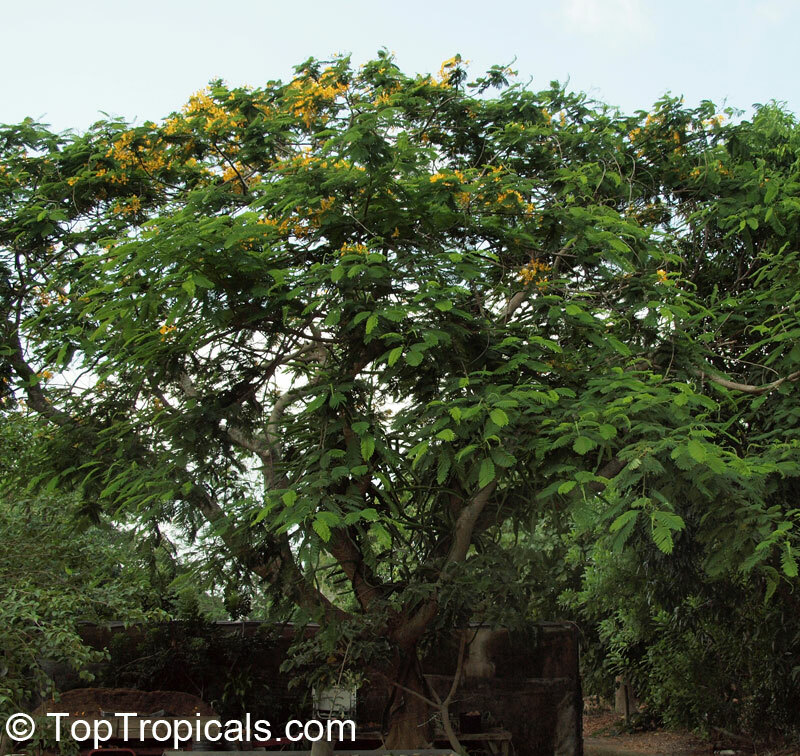 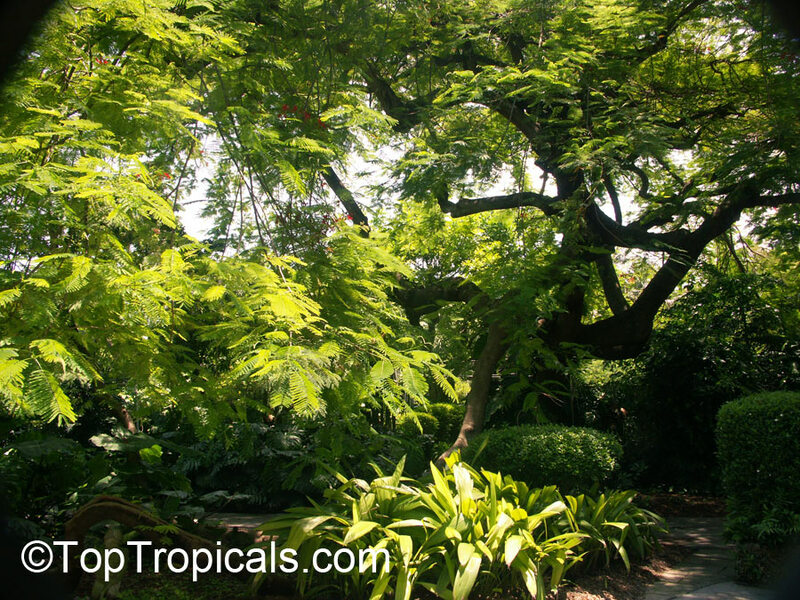 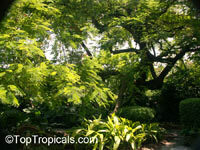 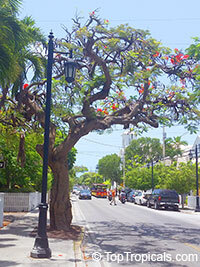 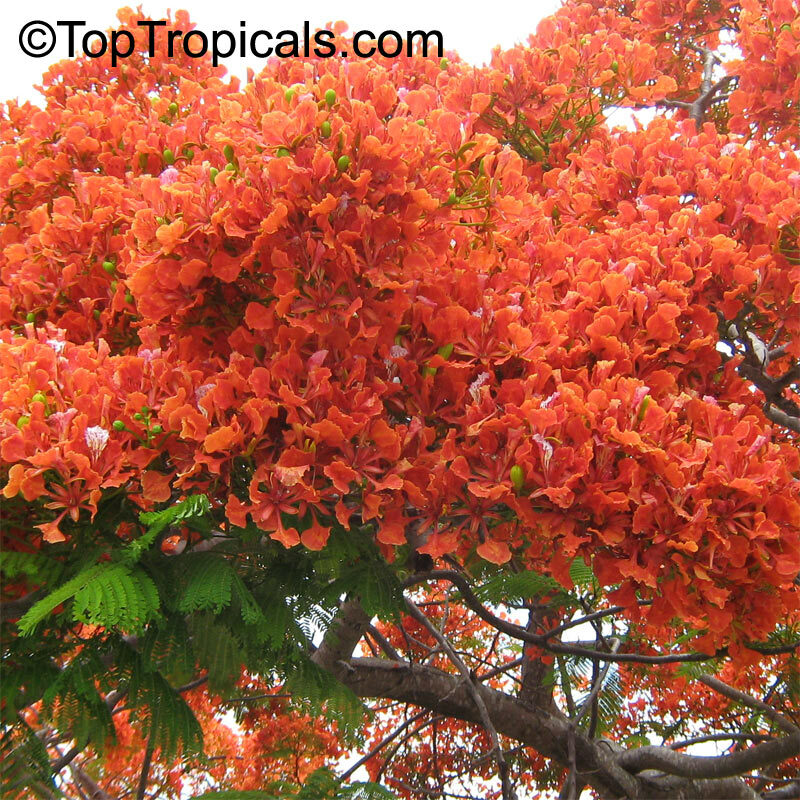 A must for any tropical garden, this tree however requires space since it spreads its branches 30-40 ft wide or more. 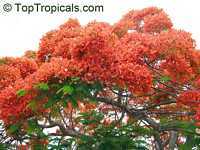 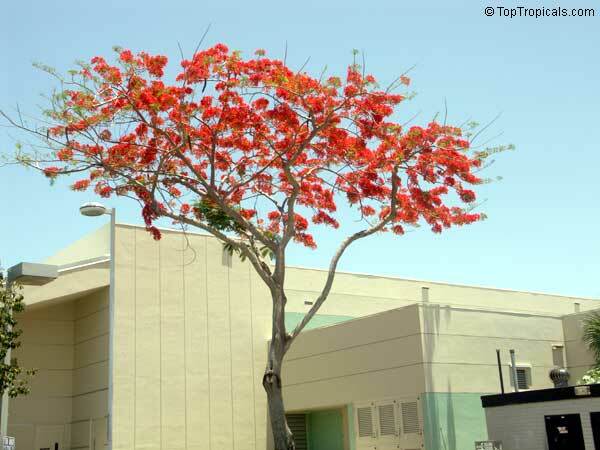 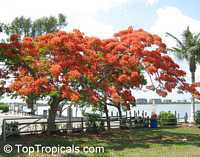 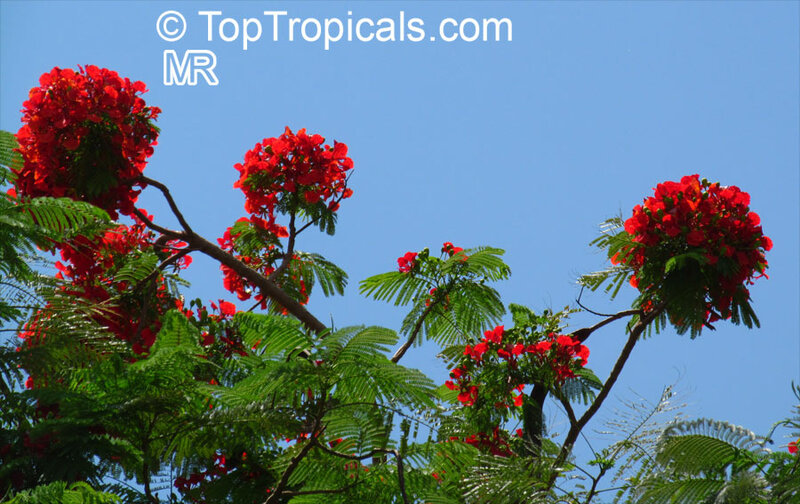 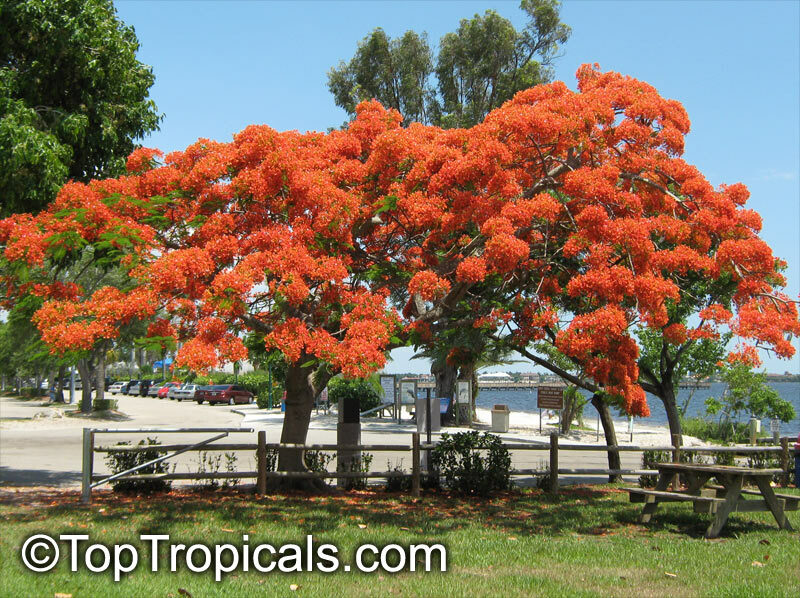 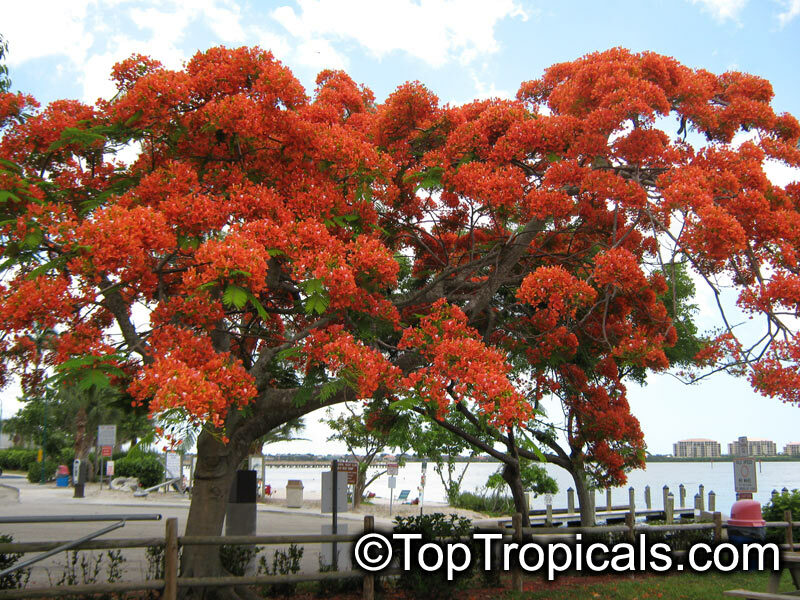 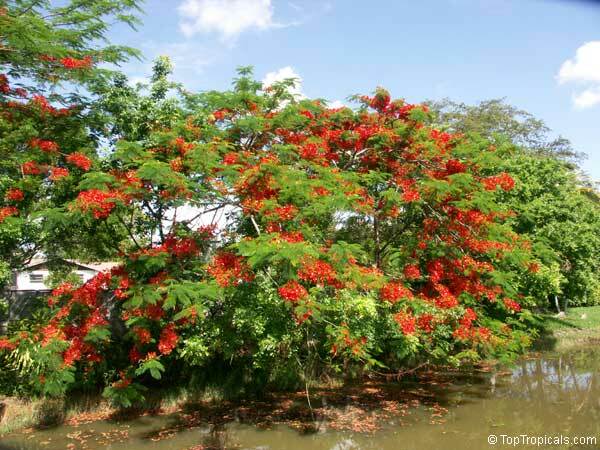 "The Royal Poinciana is one of the most spectacular flowering trees in the USA, and probably among the top 10 on this planet. 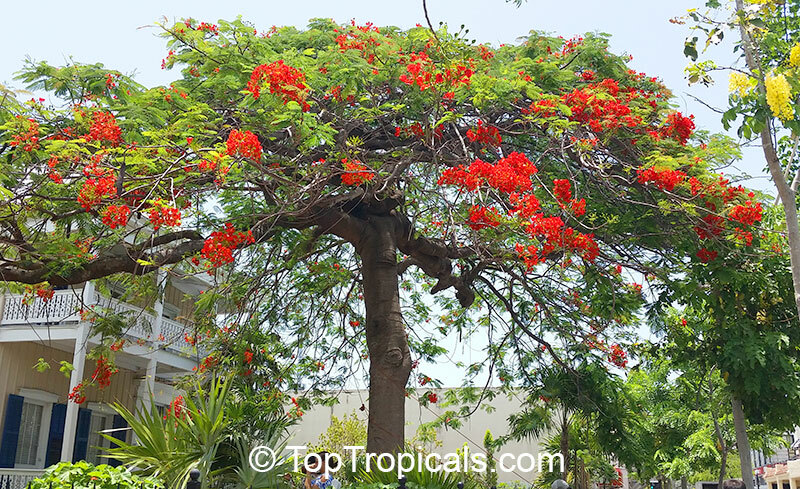 In full bloom, it is like a regal elephant caparisoned in red and yellow brilliance." 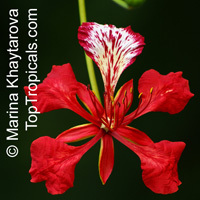 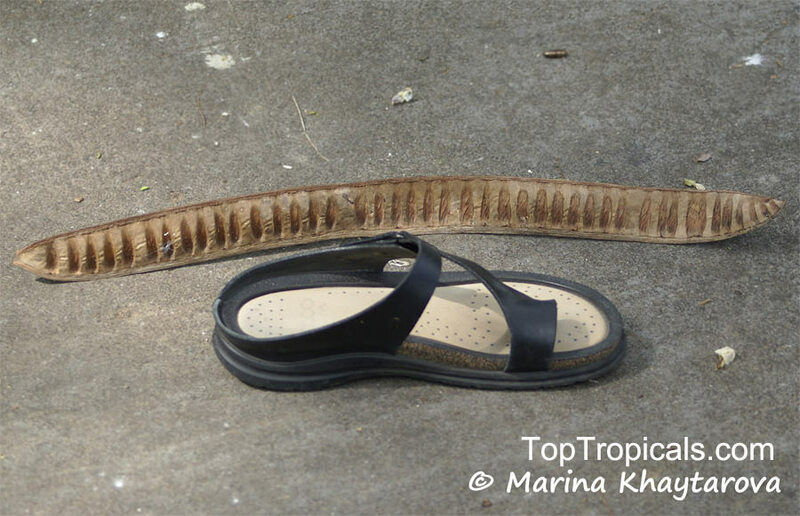 (Larry M. Schokman, The Kampong, National Tropical Botanic Garden)This item is certified for shipping to California.